It seems that everyday we are greeted by a host of new social networks vying to catch our attention. The travel industry is no exception and a host of sites have launched in the past several years all trying to capture the attention of the traveler and take a piece of the online travel market. Despite the dominance of the big players, such as Expedia and Priceline, several new social travel sites have been able to attract large audiences and significant outside investments in relatively quick time periods. Here is a quick look at the top 7 trends that the newest social travel sites are incorporating and a review of what the most successful sites are doing to engage users. Most of the new sites launched in the past several years fall into this category and are based on the premise of trying to recommend places for you to go based on advice from your network of Facebook friends. Some of the better know examples are the more established Gogobot and newly launched Tripbird. These sites bring travelers and suppliers together on the same platform and engage travelers (consumers) with a product. This space is quite varied with one end of the spectrum being dominated by p2p sites like Couchsurfing and Tripping where users get together to share rooms while they are travelling and the other end of the spectrum being dominated by more commercial sites like Airbnb where users with a room to spare can earn extra cash by renting it out. Airbnb seems to have hit things right on the mark with by combining travelers and suppliers (people with extra rooms to rent) in a social environment. The latest entrants into this segment are inbed.me which looks to bring users together who stay in the same hostel and Touristlink which aims to bring members together around group travel experiences. Wayn seems to have found the right path for bringing users together for dating or friendship but unlike traditional dating sites has a focus on bringing users together around places. Adding a new twist to this formula is Tripl which promises people not places on your next trip based on the idea of connecting you to friends of friends by essentially digging deeper into your social profile. These types of sites help create a culture of globetrotters going it alone from country to country, but still able to connect with fellow lone travelers in each country they visit. Sites letting travelers share trip experiences such as Tripbod and VirtualTourist are well established but new comers such as Kukunu and Planr are adding a new twist by giving users recommendations either from friends or based on interests derived from social profiles of members. One thing we have yet to see is a WordPress or Storify aimed at travel that takes full advantage of existing social networking tools. A number of sites have launched connecting travelers to individual travel guides in local cities. Toursbylocals is a simple and well designed platform and Vayable promises to let you book amazing experiences by connecting with locals. Some great sites are popping up in an effort to engage users around particular activities whether its cruises, expats, group adventures or even which mountains you have climbed (see Peakery). These are working by tapping into loyal and engaged audiences and powering them with social tools. With all the hype around Pinterest no doubt some travel sites are jumping in – one good example is Trippy which is similar to Pinterest but with a focus on travel. With so many sites it is difficult to draw any quick observations on what works and what does not but several themes emerge. The first is the success of sites like Airbnb which give users social tools and then engages users around a product. The second is sites like Tripadvisor which involve both suppliers and consumers in the travel community. The third is those sites which appeal to a niche set of interested and motivated users like Internations for expats. 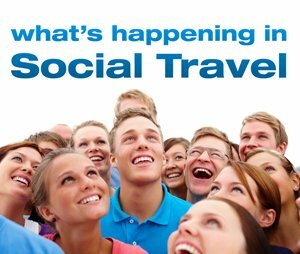 How are you using social tools for travel?